Many of us couldn’t wait until August 17th came around ever since Sophia John from 89.7 The River announced at River Riot on May 11th that a big annual concert would start this year called Knotfest. Featuring some big name bands like Deftones, Lamb of God, and Slipknot, summer couldn’t fly by fast enough. As the day got closer, fans got more information about what would be at the show. It was turning out to be a carnival combined with a rock festival. Held at The Mid America Motorplex in Pacific Junction, IA, the venue had carnival rides, a pyro zone, Slipknot Museum, vendor stations, and more along with the great music performed on two different stages. We couldn’t have asked for a more perfect day when it came to the weather, with clear skies and just the right temperature during the day for a show. The day seemed to run very smoothly, probably because of all the hard work that was put into it leading up to the day. I, personally, would like to thank everyone involved and hope this continues each year as the day seemed to be a mini vacation for all who went. Escaping everyday life of jobs, school, chores, and whatever else people wanted to get away from. It seemed many people didn’t have a care in the world at Knotfest. Many fans even dressed up for the occasion, wearing Slipknot jumpers and masks to show how much they supported the band. One of the big stories of the day was the return of Randy Blythe, lead singer of Lamb of God. Lamb of God was set to play a show in June in Prague, Czech Republic, but at the airport, he was arrested for an incident that happened at a 2010 concert there. He was held there until early August and returned to the states a couple weeks before Knotfest. During his time there, it was announced that Lamb of God would not be performing on the Knotfest dates but then they decided to play upon Randy’s return. This made it his first show since the arrest. The crowd was intense right before Lamb of God performed, chanting “Randy! Randy! Randy!” Then when the music hit and he first stepped on stage, the crowd erupted in support for him and the band. We saw Randy backstage and told him we were glad he was back in the states and that he had our support. He was very thankful and showing how much of a nice guy he is, offered to take a picture with us. Along with Lamb of God lighting up the crowd, all of the bands got the crowd going and the opening bands really set the tone for the day. When Deftones got on stage, there were a lot of fans singing along to their hit songs and saw the energy the band brought, especially the lead singer, Chino, with his energy on stage. When the headliner, Slipknot was set to perform it was a little chilly outside but no one seemed to care, especially if you were moshing in the pit. Slipknot had amazing effects, lighting, and energy on the stage. We saw one of the members, #3 Chris Fehn, backstage and he said they have been planning this for over 2 years now and wanted to show it on stage. Also they were doing it for a past member who recently passed away, Paul Gray. Since Slipknot is from Iowa, many family and friends were there to show their support which made the show extra special. 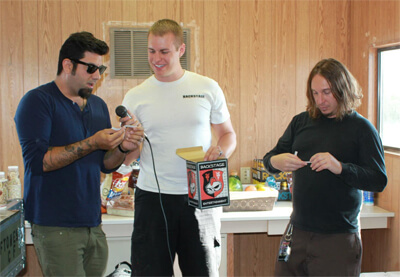 Backstage Entertainment got a chance to talk to some of the other bands performing during the day, including Dirtfedd, The Urge, Prong, and Deftones. Check out the links below for our interviews with the bands. Also check out the photos from the day in two albums including photos during our interviews, fans that dressed up for the show, and live concert shots.